Disclaimer: The tool is for experimental use only, and not for productive environments. Microsoft, Windows and other corresponding products are trademarks and owned and copyrighted by Microsoft Corporation. Windows 10 Preview (virtual or physical machine), register and download the image here. 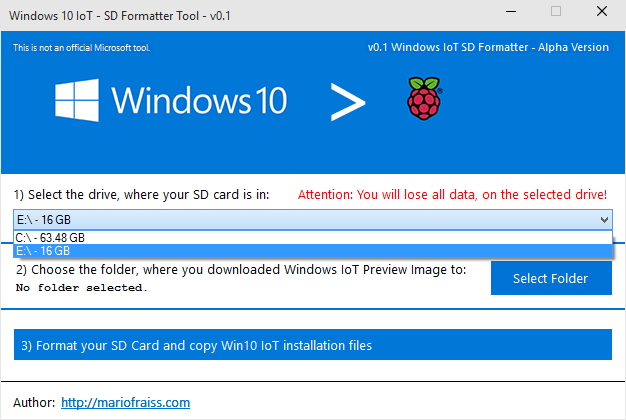 Click “Select Folder” and select the folder, where you have downloaded and extracted the Windows 10 IoT Preview image. There should be a *.ffu file in it. The tool will inform you, if you have selected a wrong folder. Finally, if you are sure you have the correct drive and previewimage-folder selected click the button “Format your SD Card” to start the formatting of your SD card and copying the Windows 10 IoT files on it. WAIT until the complete process has finished. You are done! Now insert the SD card into your Raspberry Pi and let Windows finish it’s installation and setup process. Let me know what do you think about the tool in the comments below and please inform me about any bugs you stumble upon. Thank you for your support. Did you check https://www.raspberrypi.org/forums/viewtopic.php?f=105&t=109105 ? 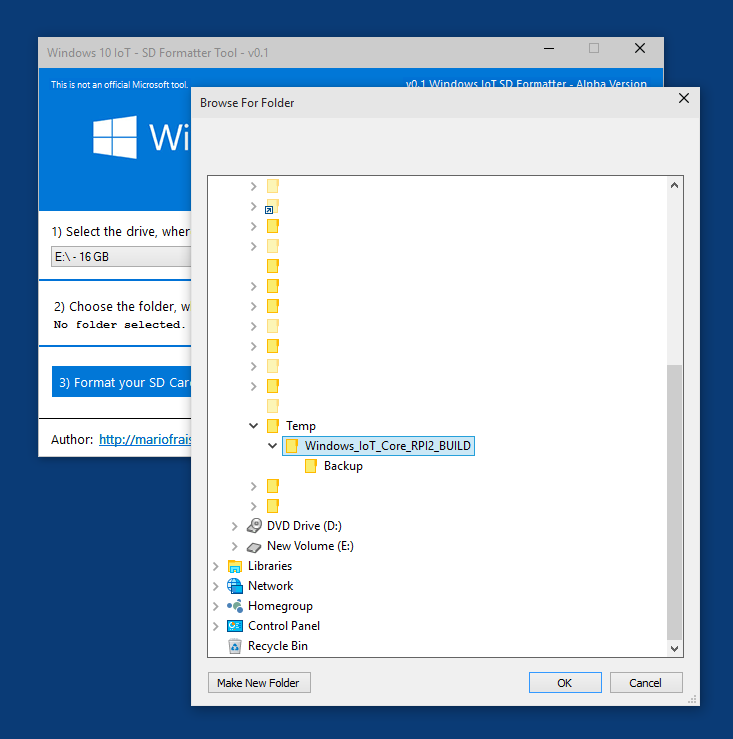 It describes using the Windows 10 ADK RC (on Windows 8.1 for example) to prepare the SD card. And it works! Yes i checked that, and in fact, it works as well, but I personally do not like to install the full Windows 10 ADK in Windows 8.1 to use only one tool out of it. Thank you, for your good wishes to the tool. Hi! Well, this tool is in an early stage but this should definitely not happen. Can you describe what happened? Which hard drives have you in your system? It would be great if you start cmd.exe as Administrator and post me the output of diskpart.exe and then list disk. Greetings and apologize for the missfunction! I’ve copied your installer and the WIn 10 image on USB external drive, I’ve correctly choose the path of sd card and the tool formatted the USB external drive. I’ve loose about 1TB of stuff !! I’ve retried again with a USB key to check if was a my mistake, same issue. The problem was your installer. I’ve run the tool on WIn10 Preview environment. I am really sorry, about your data loss. As mentioned in the article, the tool is in a very early stage and should not be used in productive environments, but only experimental environments. Which kind of devices, have you used? The tool is intended to used in combination with a USB SD-card reader, not an internal SD-card reader and not an external USB-hard drive. Nevertheless I tested the tool with a small Hard-drive-partition and it worked really well. What is your output of diskpart.exe (run as administrator), and then the command “list disk”? I know the tool is not doing anything sophisticated, it does work, and makes the flashing more click and play. – thanks. I can only select my hdd-drive, sd-card is not recognized. Any ideas? Hi! Is your SD card reader an internal or do u use an USB SD reader? Currently, using an internal reader is not supported. The problem is, that internal readers do not provide such a “drive”-type interface, which means, that it is not really recognized as a typical mapped drive. I’m working on this already… Follow my blog, to stay tuned. Unfortunately, currently external SD card readers are not supported due their difference behavior concerning drive management in windows. Same here doesn’t recognize SD-card. Is there a specific SD/ MicroSD that is know to work? Hi all! Thanks a lot for this Tuto! I just can’t undeestand where can we download the “Windows 10 Preview (virtual or physical machine)”. I am registered and I can’t understand what to download (I have two ISO but for x64 ans x32…). I’m glad that you like the tutorial and that you find it useful. Hi, Indeed, it help me well. Now I have the good “ffu” file. But now, installer launch “provisioning” and dos Windows is shut as soon as she arrived. After I have a “Congratulations…” windows but my SD card put in a USB-SDcard reader (correctly reconized) is still empty. 1) Format your SD card in windows, as you do it with any other device. 2) Try the complete process again. Also after using your formatter on my laptop and I check with File Explorer it shows empty and does not boot in the RPi2. Can you describe what happened? Which hard drives have you in your system? It would be great if you start cmd.exe as Administrator and post me the output of diskpart.exe and then list disk. This is on my desktop which has a single 500GB hard drive that is partitioned. C:,T:, E:,F:,G:,H:,J:. C:& T: are Primary dual boot partitions. Hi! wow that Are a lot of drives… Is your card Reader an internal device or an external USB card reader? it seems to copy all the files but it just won’t boot up, I get a box with colors on it and the screen goes blank. I used your tool and it does the exact same thing not booting up. any ideas? Like I said the sd card has a lot of files and folders just doesn’t boot. What is the content on your SD card right now? Hi, i’m trying to use your tool, but have a 87 error : unnown par – apply-image… I think, it’s because i do it under Win7… Can you help me without upgrading to win8-win10?